With any point on Earth covered at least once a day, Astrium Services provides unrivaled access to the most comprehensive range of commercial Earth observation data available today. Airbus Defence & Space data products comprise imagery acquired by the Pléiades constellation, the SPOT constellation, TerraSAR-X, TanDEM-X and from partner satellites such as FORMOSAT-2 and DEIMOS-1. 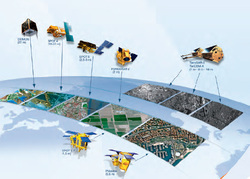 As a satellite operator, with strong partnerships with other operators and their own airborne capabilities, Astrium provides access to the most complete range of Earth observation data on the market: an efficient answer to your needs for imagery whatever the scale, the location or the timeliness!